When it comes to preparing your body for baby, there are two very important groups of muscles you should focus on: your pelvic floor muscles and your transverse abdominal (TA) muscles, both of which comprise your deep core muscles. Your pelvic floor is made up of the muscles you use to do your kegels. If you aren't doing kegels—it's time to start! These muscles extend underneath from the front of your pubic bone to your tailbone. When doing a kegel, pull up on your pelvic floor by drawing the front and back of your pelvic floor together, thinking of lifting a wet towel up through the center of your body. Repeat for several repetitions and practice throughout the day. These muscles also coordinate bladder control; that's why it's so important to exercise them! When doing kegels correctly, you will be able to feel a light connection of your pelvic floor, and you will be able to continue taking normal breaths at the same time. If you find yourself holding your breath, you are probably squeezing too tightly. Your transverse abdominals (TA) (see image above) are the muscles that wrap around your lower torso. 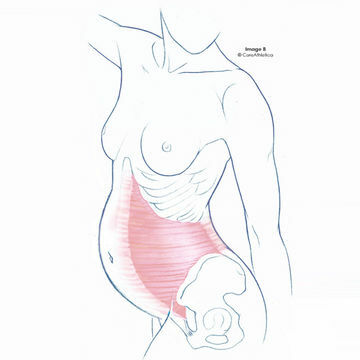 I find for my clients, it's easier to activate these muscles during pregnancy. To work your TA, think about "hugging your baby" by gently pulling your abdominals "in, up and around". You may actually be able to see your belly get smaller as you practice engaging your TA; it should feel as though you have a tight belt around your lower midsection. Having a strong TA will help you push your baby out more quickly and flatten your tummy faster after delivery! You can practice engaging both your pelvic floor and TA regularly, especially when you are exercising. By engaging these muscles you can make exercise more effective, which makes you stronger. Before you begin an exercise, think kegel first, then hug your baby. Remember if you are having a hard time taking in a full breath, you should stop squeezing so tightly. Rather, gently pull "in, up and around". With practice you'll find they both work together! Ready to engage these crucial pregnancy muscles? Try The Prenatal Exercise That Strengthens Your Deep Core. Reprinted with permission from The Knocked-Up Fitness Guide to Pregnancy by Erica Ziel, Core Athletica Inc.